•General: View data object metadata including source data information, statistics, native coordinate system, field mappings; view the attribute and geometry table. •Operations: Apply arithmetic and geometric operations to data object geometry and attributes. •Style Settings: Modify various style settings for different data object elements, e.g., point/line symbology, show labels, color rendering by attribute, create isosurfaces, set transparency etc. 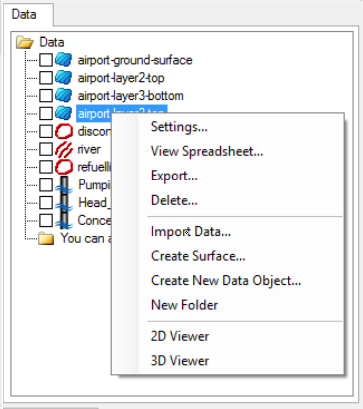 Data object settings can be accessed from the main Visual MODFLOW Flex window. To view the settings for a data object, in the Data Explorer, right-click on the desired data object and select Settings... from the pop-up menu.